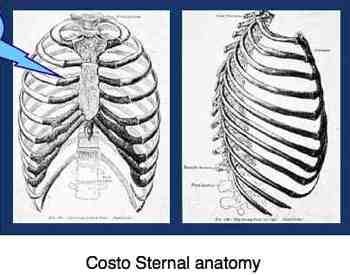 Costosternal anatomy describes the muscles and joints of the chest. 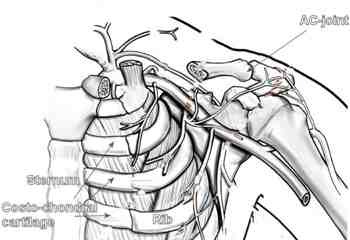 The costosternal anatomy makes up the thoracic wall. This area is unique in the body, and quite different to the other bones and joints. This is because of its important function of protecting of the vital organs, whilst still enabling breathing. The ribs make up an important part of the thoracic wall. 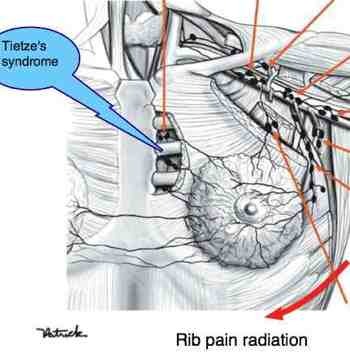 The joints between the breastbone and the ribs are made up of special so called costal cartilage which may sometimes become a very painful condition called Tietzes syndrome, or breastbone pain. Note the costal cartilages arrowed in blue below. They can also be injured by trauma, for example, falling on your fist whilst skating, or hitting the steering wheel during a head on collision. Always use a safety belt. The spaces between the ribs are filled by the INTERCOSTAL MUSCLES. These muscles extends from the sternum to the angle of the rib, posteriorly. They are very important in breathing. The PECTORALIS MAJOR muscle is can be seen on the anterior thoracic wall. It has two origins, one of which is the sternocostal cartilages and the other the sternum bone. 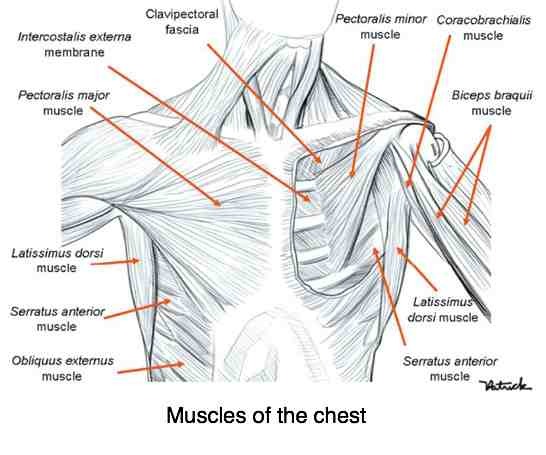 The PECTORALIS MINOR muscle is located at a deeper level than the pectoralis major muscle. It originates from the third, fourth and fifth ribs and is inserted in the coracoid process of the scapula. The SERRATUS ANTERIOR muscle covers most of the lateral thoracic wall and originates from the first nine ribs. Its fibers converge posteriorly to be inserted into the medial margin of the scapula, thus contributing towards forming the medial wall of the axilla. The diminutive SUBCLAVIUS muscle originates from the first rib, close to the chondrocostal junction, to be inserted in the collarbone. Its function is to stabilize the clavicle in movements of the shoulder. 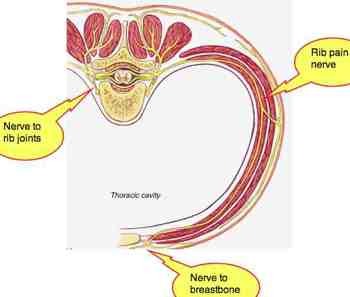 Breastbone pain can be very severe. These costosternal anatomy joints, when subluxated, are a common cause of chest pain. Chiropractic treatment involves stretching the doctor's hands right around the ribcage, from the sternum to the spine, an providing gentle thrusts to release the fixations. Two with the vertebral bodies above and below the rib, the so called costo vertebral joints. This arrangement restrains the motion of the ribs allowing them to work in a parallel fashion during breathing. If a rib had only one joint posteriorly, the resultant swivel action would allow a rib to move out of sinc with respect to its neighboring ribs, making for a very inefficient respiratory mechanism. These joints may be sprained, often after a violent sneeze, causing severe sharp pain with every breath. The condition responds extremely well to a gentle chiropractic adjustment. Treatment for costochondritis is just standard, but modified chiropractic help. Understanding rib pain causes is important. 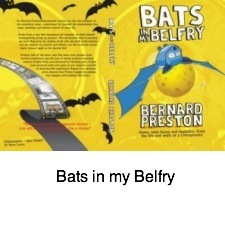 If you love to read, you will probably enjoy batty chiropractor Bernard Preston's latest book, Bats in my Belfry. Notice the three arrowed facets where the rib head can be subluxated causing severe pain. The thoracic spine is usually not the source of serious problems. 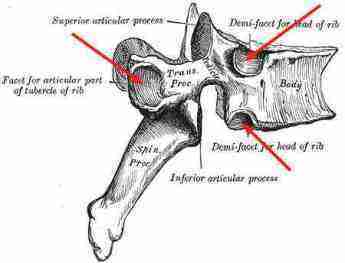 Irritating, and occasionally acute pain, but because of the stabilising ribs, it generally gives much less serious trouble than the neck and lower back. Consequently, it also less xrayed. Chiropractors generally, myself included will often adjust the thoracic spine without first having given it the attention that one might give the lumbar spine. Mrs S is a woman of about thirty who had significant Low Back Pain since shortly after the birth of her first child, about three years ago. Opinion has it that much low back pain starts during the last trimester, but in my experience it often starts soon AFTER the birth of the child. All the lifting, but sometimes within a month of falling pregnant. The lower back pain didn't improve with various other medical ministrations, and six months the pain started radiating down her leg. She has responded very well, and after a month her low back and leg pain is almost gone. But I adjusted a subluxation between her shoulder blades, where she had no pain, and she is now really suffering. It's a little better, but she's not a happy lady. She came with one pain, and left with another. 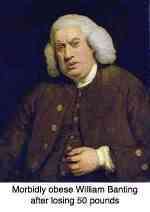 That's what we call Iatrogenic Illness, or doctor caused disease. UPDATE: Fortunately with the correct management of her rib the pain soon passed. My point? Rib pain can be caused by an overly zealous manipulation in the mid back. The breast obviously lies just adjacent to the costo-sternal joints, and covers some of the muscles. A breast condition may mimic the costo-sternal syndrome, and occasionally a breast examination by your chiropractor may be indicated. Alternatively, you could ask that your GP do the examination. Talk frankly about it. During the treatment of the costo-chondral syndrome, the doctor's hands will approximate the breast tissue as s/he firmly adjusts the rib during the in or out phase of breathing. He should release his grip, and slightly remove his hands during the inactive phase of breathing, to ensure that there is no embarrassment. Should you feel awkward then it may be necessary to ask a friend or family member to accompany you for breastbone pain treatment, or ask if the secretary may be present. It is best to talk frankly about it. The NERVE bundles from the spine, are threaded between the muscle layers, and are responsible for the innervation of the intercostal muscles. The pain often radiates along the length of the rib causing flank pain (under the armpit), chest pain mimicking a heart attack if it's on the left side and, if it involves the lower ribs on the right, gallbladder or liver conditions. First thought with indigestion should always be to drink first, though, and eat afterwards, especially at night, and avoid bread and rolls.